Whether you are lunching on the pier or shopping in town, you are going to love showing off your Hamptons Tote! 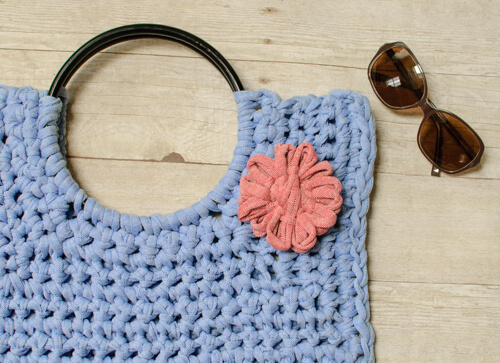 This T-shirt yarn crochet bag pattern calls for just 1 skein of T-shirt yarn to make. Add a flower embellishment for extra interest or let the bag shine on it’s own … the choice is yours! Finished bag measures approximately 16.5 in. wide x 13.5 in. tall, not including handle. Row 1: Work 20 sc around handle, turn – 20 sts. 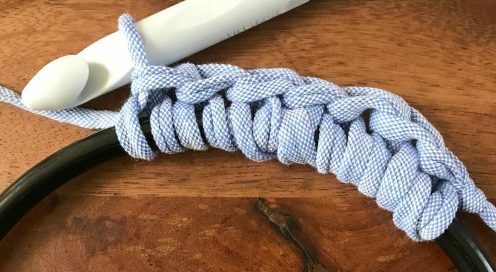 To work around handle, begin with a slip knot on your hook. Keeping the working yarn behind the handle, bring your hook to the front, insert your hook through the handle and grab yarn from behind and pull up, yarn over and pull through 2 loops on hook (first single crochet made). 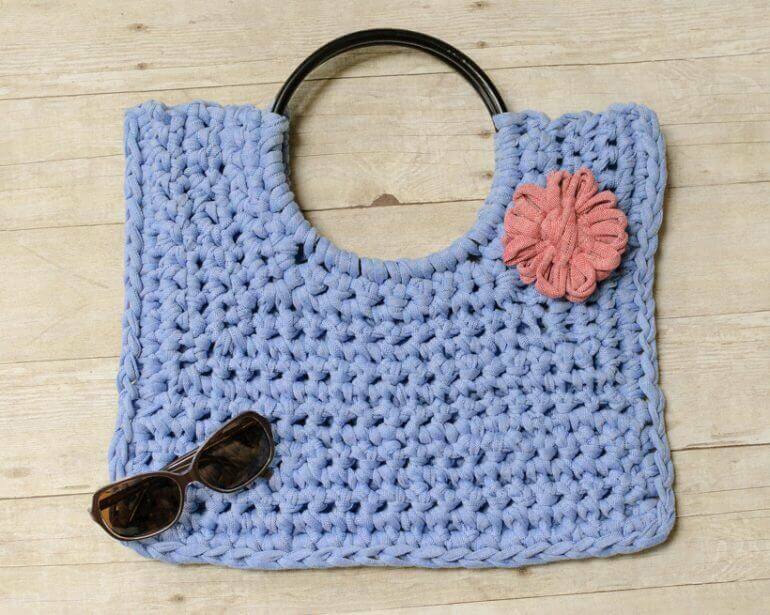 Continue working around handle for a total of 20 single crochets. Row 2: Ch 1, work 1 sc in each of the next 6 sts, 3 sc in next st, 1 sc in each of the next 6 sts, 3 sc in next st, 1 sc in each of the next 6 sts, turn – 24 sts. Row 3: Ch 1, work 1 sc in each of the next 7 sts, 3 sc in next st, 1 sc in each of the next 8 sts, 3 sc in next st, 1 sc in each of the next 7 sts, turn – 28 sts. Row 4: Ch 1, work 1 sc in each of the next 8 sts, 3 sc in next st, 1 sc in each of the next 10 sts, 3 sc in next st, 1 sc in each of the next 8 sts, turn – 32 sts. Row 5: Ch 1, work 1 sc in each of the next 9 sts, 3 sc in next st, 1 sc in each of the next 12 sts, 3 sc in next st, 1 sc in each of the next 9 sts, turn – 36 sts. Row 6: Ch 1, work 1 sc in each of the next 10 sts, 3 sc in next st, 1 sc in each of the next 14 sts, 3 sc in next st, 1 sc in each of the next 9 sts, turn – 40 sts. Row 7: Ch 1, work 1 sc in each of the next 11 sts, 3 sc in next st, 1 sc in each of the next 16 sts, 3 sc in next st, 1 sc in each of the next 11 sts, turn – 44 sts. Row 8: Skip first 12 sts and rejoin yarn in next st, ch 1 and work 1 sc in same st as join and each of the next 19 sts, turn – 20 sts. Row 9: Ch 1, work 1 sc in each st across, turn – 20 sts. Rows 10 through 13: Ch 1, work 1 sc in each st across, turn – 20 sts. Place panels together with wrong sides facing. Leaving the top of the bag open. Join yarn through both panels on top left corner. Ch 1 and, working through both layers, work 17 sc along edge of bag, 3 sc in bottom corner, 18 sc along bottom edge, 3 sc in corner, 17 sc along right edge. Fasten off, weave in ends. Add a loom flower for embellishment if you wish. Continue wrapping the yarn around each tab and its opposite around the loom and repeat for a second pass. There should be two loops around each tab when you’re finished. Leaving a tail of a few inches, cut your yarn and use a tapestry needle or your hook to pull the tail through the center. Starting from behind the loom, use a tapestry needle to stitch up and down through each loop to secure all the petals. Continue stitching until the petals are secure. Pull yarn through to back and knot with beginning tail to secure. Gently pull flower up off loom. Get more T-shirt yarn ideas here!